Why Should a School District Go Solar? Source: Burning Our Rivers. Wilson, Leipzig & Griffiths-Sattenspiel, 2011. Solar can provide schools with a new onsite technology tool that serves as a backdrop for compelling Science, Technology, Engineering, and Math (STEM) lesson plans. Many school districts are requiring that solar vendors include an educational component in the project contract. This means that existing STEM programs and academies can enhance their programs with a specific focus on energy. Schools that installed solar have been able to use their solar systems as a helpful hands-on tool for teaching important math, chemistry, and physics concepts to students of all ages. Moreover, onsite solar introduces our students to the clean energy resources and technology of the future. 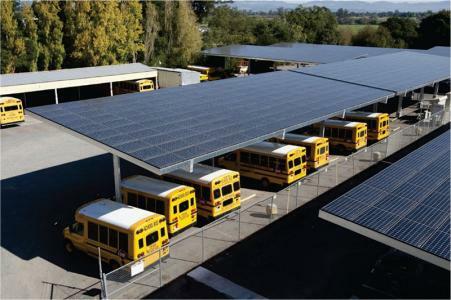 There are many existing curriculum materials programs that easily benefit from onsite school solar energy systems as a unique STEM laboratory. Developed at The Lawrence Hall of Science at UC Berkeley, Global Systems Science is such a curriculum for grades 9-12 that focuses on science-related societal issues and can support a 1- to 2-year integrated science course or supplement existing biology, physics, chemistry, Earth science, or environmental science courses. 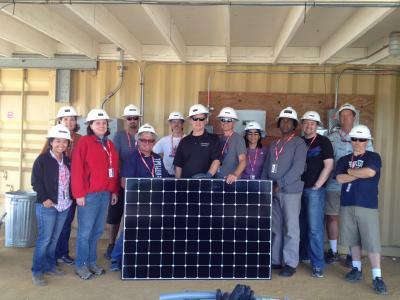 California teachers attending the Summer Solar Energy Academy, sponsored by SunPower Corp. Solar reduces local air pollution and protects community health. Fossil-fuel-based electricity generation releases NOx and SO2 (sulfur dioxide), all of which contribute to the formation of fine particulate matter and ground-level ozone (commonly referred to as smog).5 By replacing fossil fuel use, solar can help reduce local air pollution in communities where fossil fuel plants are located. The National Renewable Energy Laboratory projects that the adoption of solar can produce local health benefits, including decreased instances of cardiovascular and respiratory illnesses. Solar demonstrates a commitment to our children’s future. Climate change presents a real threat to our children’s future. Investing in solar on our schools introduces our students to resource-conserving technologies and demonstrates how we can all take local action to help combat climate change. Solar provides energy independence. Solar is a local source of energy, allowing us to produce electricity from sunlight that hits our rooftops and parking lots, instead of relying on resources that are extracted and imported from around the world. The solar installation sector workforce is also more diverse than that of other energy sectors, with nearly a quarter of the workforce comprised of women and a significant minority population.6 In addition, there are new programs to assist veterans of the Armed Services in securing employment in the solar industry.